No standing on the stairs... but the chap on the right is the BBC's Tom Edwards, so we'll let him off. Update: We took a second trip on the bus during Monday's evening rush hour. Here are some further thoughts from the ride. 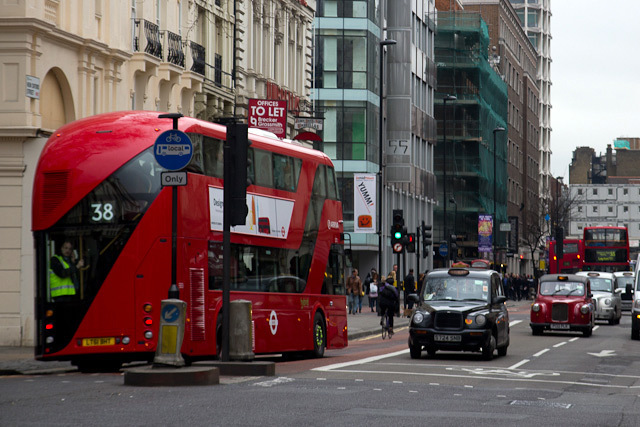 In contrast with the much-delayed inaugural journey, the New Bus rolled into view on Shaftesbury Avenue just minutes after the timetable suggested it would — not bad for the latter end of a rush-hour trip through central London. 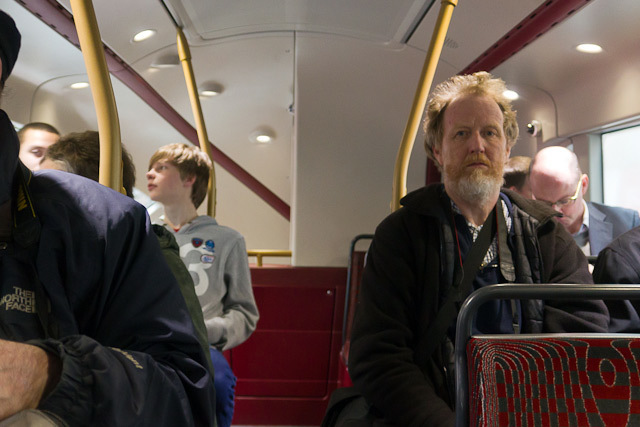 On this trip, DSLRs and excitable bus-lovers were replaced by briefcases and regular commuters, but what hadn't disappeared was the palpable sense of excitement on board. The rear platform, which was closed during the first trip due to a software error, remained open throughout the second trip, and people were able to jump on and off at their leisure; rare was the person who didn't have at least the glimmer of a grin on their face as they did so. Outside on the street, pedestrians street stopped and pointed and (inevitably) reached for their phones to take a snapshot. 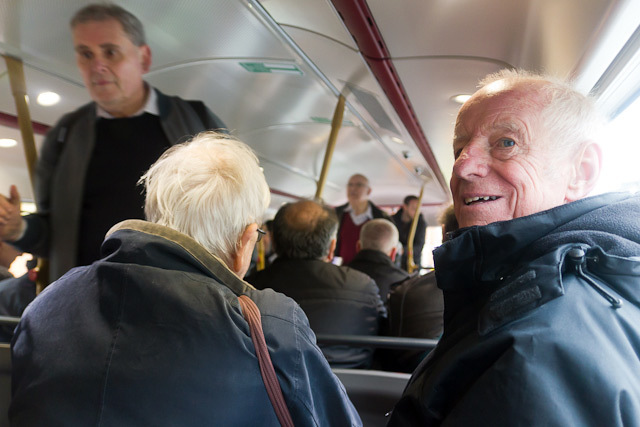 On board, total strangers struck up conversations about the 'return of the Routemaster'. Vanity project or no, the New Bus is certainly a head-turner and a talking point. Concerns remain about the ventilation: downstairs the heaters were on, presumably to counteract the open platform, although the evening air wasn't cool enough to justify it, and upstairs it was still on the warm side. Hopefully these are issues that be can resolved. The question of the conductor is still a vexing one too. Andrew Gilligan suggests that Transport for London has deliberately made their role limited so that they can be axed at the first opportunity. Some wild estimates about the cost of employing them have also been bandied around. However, the 'conductor' we chatted to was in fact a fully-qualified driver for Arriva London himself, and was taking it in turns with driving the thing with the chap currently behind the wheel. As expected, he didn't do an awful lot on the journey to Victoria, but it was nice to have someone direct embarking passengers to where the (few) spare seats were, and asking passengers to shuffle along inside, rather than the automated voice which usually makes such requests. For other reports on the New Bus for London, see the Guardian's Dave Hill (who was kind enough to mention us in his piece), while both the BBC and Telegraph have video reports showing it in action. There's also an excellent infographic on the bus by the Guardian. If you want to ride it yourself, see the timetables linked to at the bottom of this post (although it seems that the post-8pm journeys for this week aren't being run). 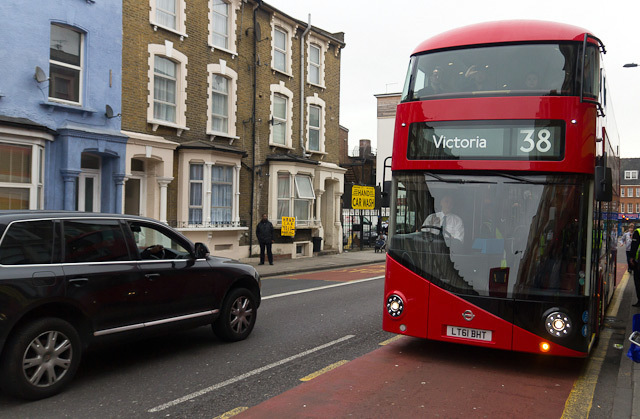 Shortly after 12pm today, the New Bus for London turned into Graham Road, Hackney, and entered service on the 38 route. Not that the maiden voyage was a typical journey. A crowd of journos, bus enthusiasts and curious locals had made the trip out to E8 to try it out, with various harassed-looking Transport for London officials and a few policeman on hand trying to keep people off the road. 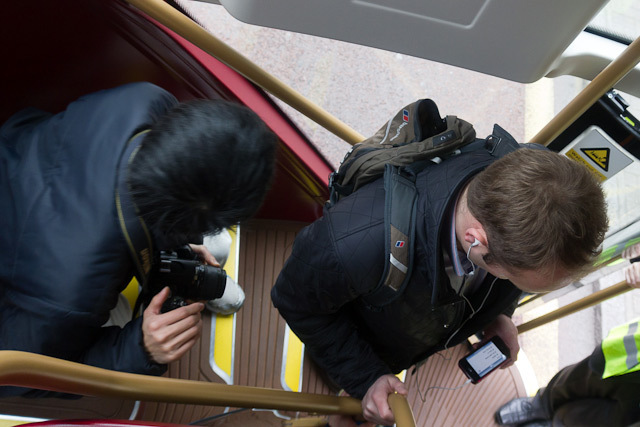 Londonist was among the first on board, climbing up the rear stairs and taking a seat midway along the vehicle's right side. 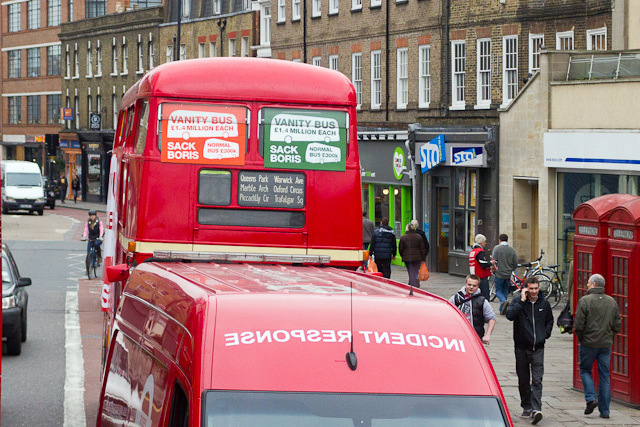 After a few minutes, the bus was on its way, tailed by a Routemaster hired by the 'Sack Boris' group and daubed with banners decrying its 21st-century replacement as a vanity project. Predictably, the journey was slow given the chaos of cameramen and radio presenters on board, and an incessant alarm sounding every time the bus moved off didn't help matters (fortunately this was remedied after a few minutes). On the upper deck it quickly became very stuffy, and condensation formed on the windows; normally no problem, but the New Bus has fixed windows that cannot be opened. 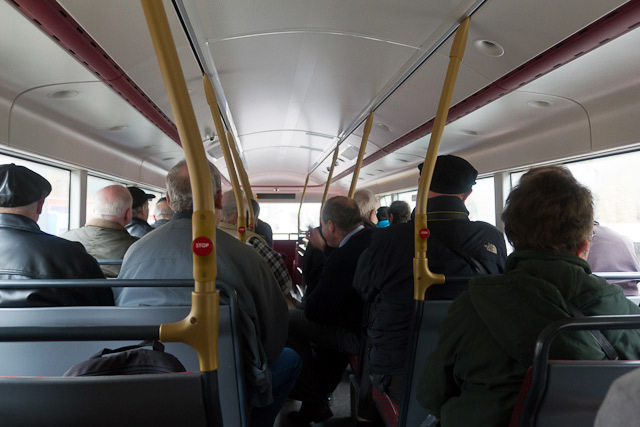 Eventually the air-conditioning did kick in intermittently, but if things become sweaty on a mild February day, the bus might be a less than pleasant place to be come summer. 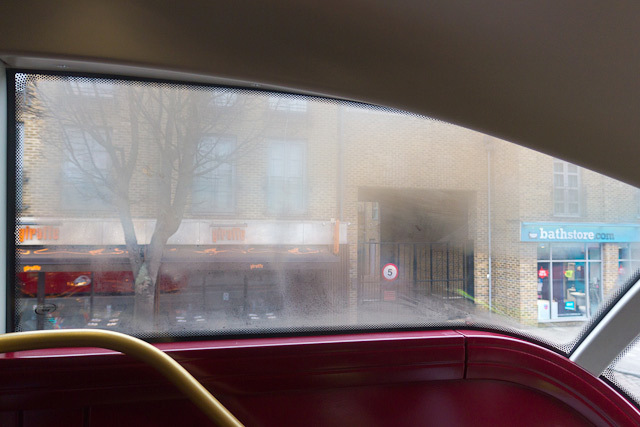 The view out of the back from the upper deck is non-existent; annoying if you're trying to jump on another bus behind. The upper deck is also quite gloomy overall, owing to its small windows. While the lights are attractive, they aren't the brightest. In another moment of health-and-safety heroism, there's a sticker at the top of the rear staircase advising users that an open platform is at the bottom. Speaking of the open platform: it remained closed for most of the time when the bus was in motion, presumably because it was very full for most of the journey. (update: according to the BBC the rear platform was kept closed on this journey due to a software glitch). Everybody has an opinion on the New Bus. Boris-bots hail it as a brand new vision of the future for public transportation. Ken-clones deride it as a costly vanity project. The truth is somewhere in the middle. Most people we chatted with seemed broadly positive about the bus, albeit with some of the reservations detailed above. It's far too early to tell whether the vehicle will be a success, and indeed much depends on what happens next. 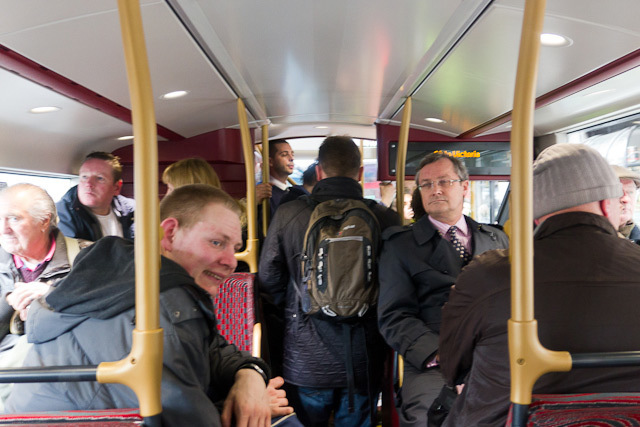 The existing outlay of £11.37m has bought us eight prototype buses. 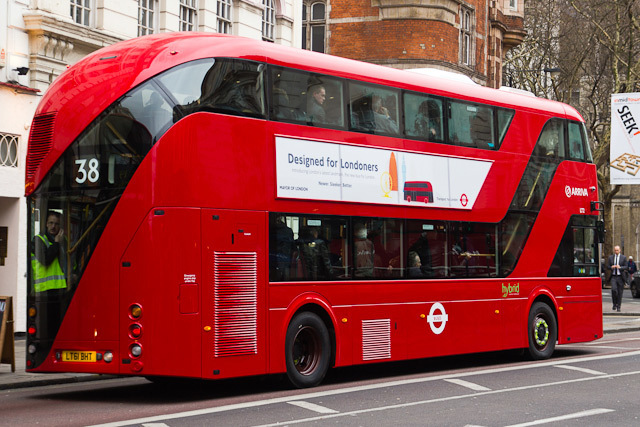 Should the vehicle go into mass production, costs would fall to around the same as a standard double-decker. Of course, that's a big if, particularly if there's a change at City Hall in the next few months. For now, it's a cautious opening in a new chapter for London transport. There are bound to be technical issues to overcome; these are prototype vehicles, and things won't always go smoothly (in fact we hear that the bus has been delayed at Victoria this afternoon whilst engineers work on a few things). And quite what future psephologists will make of the extraordinary obsession with the shape of a bus, which has been one of the dominant discussions in London politics over the last few years, is another matter entirely. We'll be riding again later today or tomorrow, to see how it operates in normal, media-frenzy-free usage. If you want to travel on the bus, of which there's only one in service at the moment, here's a timetable (pdf) for the first week. From next week, when there are two available, it should revert to this service. Note that at the moment the bus will not be running at night or on weekends.